They call him the “Jackie Robinson of hockey,” but to get that honor, it cost Willie O’Ree the sight in his right eye and many nights of racial slurs, threats and fights. Yet if he had the opportunity again, he wouldn’t change a thing. He’s now 81 years young with a memory as sharp as his wit. Today, O’Ree crisscrosses the country to promote a sport that initially didn’t embrace him but now recognizes him as a living legend. O’Ree, who was born in Fredericton, New Brunswick, was playing his second season in the Quebec Senior Hockey League with the Quebec Aces when the Boston Bruins called him up for two games in 1958. That was 11 years after Robinson’s historic feat with the Brooklyn Dodgers on April 15, 1947. The Bruins, who called O’Ree up to replace an injured player, didn’t know that he had lost 95 percent of the vision in his right eye two years earlier after getting hit with an errant puck. Had they known of his injury, O’Ree would’ve never seen a second of ice time in the National Hockey League. “I didn’t tell anyone that I couldn’t see,” said O’Ree. “My sister, Betty, and my good friend, another black player named Stan Maxwell, were the only ones who knew that I couldn’t see. I didn’t tell my mom and dad because I didn’t want them to worry. Willie O’Ree #25 of the Boston Bruins skates with the puck as Camille Henry #21 of the New York Rangers looks defend during their NHL game circa 1961 at the Madison Square Garden in New York, New York. “I didn’t let that stop me. Back then, they didn’t have physicals like the ones given today. I could still see out of my left eye. I wanted to play and I did what I had to do to compensate for the injury. After being injured, I came back and tried to play as if I had recovered. On Jan. 18, 1958, an African-Canadian holding a secret that should’ve ended his career before it started crossed the NHL’s color line and played against the Montreal Canadiens, a team he grew up watching. At the time, the Canadiens were in the third season of a five-year run as Stanley Cup champions. A year earlier, Montreal defeated Boston 4-1 in the Stanley Cup finals. The Canadiens would go on to beat the Bruins 4-2 in the 1958 championship series. He didn’t register anything statistically, but those two games did a lot for O’Ree mentally. He always wanted to be a great player and reaching the NHL for that brief period was encouraging. 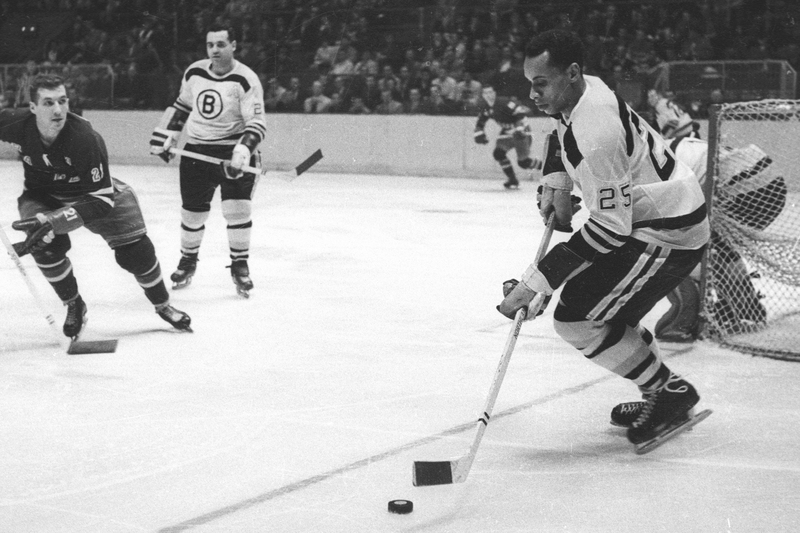 During the 1960-61 season, O’Ree got a second opportunity to play for the Bruins. He appeared in 43 games, collecting 14 points on four goals and 10 assists. He also logged 26 penalty minutes. Cheap shots were the norm and O’Ree, despite his bad eye, watched out for them. After that season, O’Ree spent the rest of his professional career in the minors. He stopped skating in 1979 after a lengthy stint in the Western Hockey League playing with teams in Los Angeles and San Diego. O’Ree now calls San Diego home. In 1998, O’Ree became the director of youth development for the NHL/USA Hockey Diversity Task Force, a nonprofit program for minority youth. The program encourages youngsters to learn and play hockey. Just last month, he was honored by the Los Angeles Kings for his contributions and pioneering efforts. 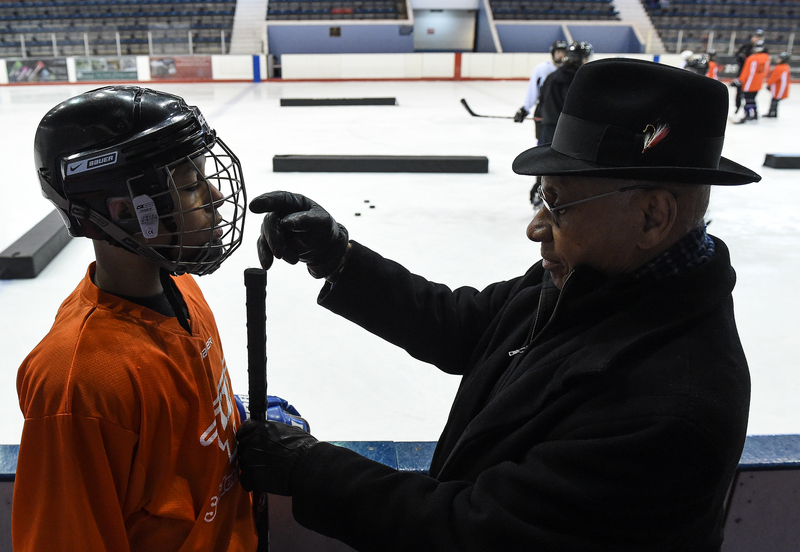 Willie O’Ree checks the height of the stick of Jeremiah Alvarado, 13, of Buffalo, New York, during the 2016 NHL/Willie ORee Skills Weekend hosted by the Ed Snider Youth Hockey Foundation in Philadelphia, Pa. on Saturday, March 5, 2016. O’Ree, the first black player in the National Hockey League, made his NHL debut with the Bruins on January 18, 1958. O’Ree, who was at the Staples Center in Los Angeles to see Simmonds win the award, is aware of the changes in the sport. “Hockey has opened up for everybody,” he said. “I can see more [black] players coming in. A lot has changed and that’s good. I was the first one and 16 years later, Mike Marson was the first [black] player drafted” by the Washington Capitals in 1974. With time, the NHL has realized that O’Ree’s contribution to the game is priceless. O’Ree has been the recipient of many awards and honors, from being inducted into the New Brunswick Sports Hall of Fame in 1984 to getting the Lester Patrick Award in 2000, which is given annually for hockey service in the United States to receiving the Order of New Brunswick in 2005. In 2008, he was honored by the naming of Willie O’Ree Place at the Fredericton Arena. When he was 14, O’Ree played baseball and was pretty good. His team won a championship and as a reward, was treated to a trip to New York City. On the tour, he met Robinson. “He had broken baseball’s color barrier only two years prior, in 1947 and to us he’s an icon. We went to Ebbets Field and watched a Dodgers game. We met him afterwards. “When I get my chance to shake his hand, I said, ‘Nice to meet you, Mr. Robinson,’ I say, ‘I’m Willie O’Ree.’ Jackie Robinson says, ‘Nice to meet you, Willie,’ while shaking my hand. The next time he met Robinson was at an NAACP luncheon in Los Angeles in 1962. Daryl Bell is the assistant news editor and columnist for The Philadelphia Tribune. He's a veteran journalist who has covered every major sport, and many minor ones.